In my conversations with financial advisors, one question comes up fairly frequently: how to build trust with clients. Is there a shortcut? Maybe not a shortcut, per se, but certainly a method that has generated positive results. It involves asking clients personal questions and digging deeper into what motivates them. Most financial advisors do what they can to be credible and reliable and to avoid self-interest, but those who excel know how to build trust through intimacy. Marketing experts talk about two types of loyalty, functional and emotional. Consumers exhibit functional loyalty when they choose products based on price or a particular feature that competing products don't have. In our world, this might be lower fees or access to a particular investment. As you can imagine, functional loyalty is easy to break—it's simply a matter of offering lower fees or providing the desired feature. Emotional loyalty, on the other hand, is much harder to crack—and sometimes even unbreakable. Think of the hold that Apple has on its fans or the allegiance you may feel toward a sports team. This is the type of loyalty you create when you have an emotional bond with your clients. And building that bond starts with learning a bit more about what makes them tick. Fears: When it comes to your money, what worries you? What keeps you up at night? Strengths: What are some things you're pretty good at when it comes to money? Lessons learned: What are some financial mistakes you've made in the past? If we encounter a similar situation in the future, what would you like us to do differently? Stress reduction: When you feel stressed, what is the most effective way to get yourself unstressed, in order to make better decisions? Armed with answers to these questions, you'll be better equipped to rein in your clients' financial decision making, using trustworthy language they've already shared with you. 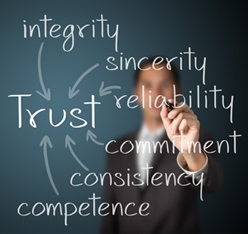 What other methods are successful in building client trust and loyalty? Tell us in the comments section below.